As the digitization wave continues to break into the realms of the corporate world, mitigating and preventing data theft has become even more crucial than it ever was in the history of business and IT. Data breaches, be it premeditated or accidental, can have catastrophic effects on the victims of data theft as any compromise of their personal information puts their identities and financial information at risk. It could result in the levying of hefty fines or even imprisonment for company executives found guilty. The massive volumes of digital data place an unwanted load on an enterprise’s IT infrastructure, resulting in increasing overheads, and reduced quality of security of business-critical data. With the increasing use of technology, data breach or data theft has become a common phenomenon in corporate spaces. The rise in BYOD (Bring Your Own Device) culture in organizations, along with the growing penetration of mobiles and other handheld devices have given a greater incentive to notorious employees for misuse of confidential and copyrighted data belonging to their employer. 110.0 million INR: The average total cost of the data breach (loss of confidential data) in India till June 2017. A record high of over 45% of data breaches was experienced by the business sector in 2016, followed closely by the medical/healthcare segment (34.5%). What rings the alarm bell is that data thieves are becoming more and more technologically advanced and are resorting to newer methods of breaking through corporate and bank information systems. How can a Corporate fall prey to Data Theft? Valuable data available on systems can be easily accessed if they are not password protected or have easily decodable passwords. The absence of any encryption mechanism while sending data on insecure line, can subject it to being wiretapped or recorded for illicit use. The rising cases of theft of corporate laptops lacking data encryption also increase the chances of valuable information stored in the laptop being sold to competitors. 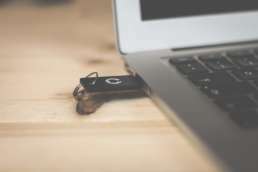 Additionally, with the increase in the storage capacities of USB mass storage devices, and a decrease in their price, it has become easier for perpetrators to illicitly download confidential corporate data from a network endpoint. Victim Of Data Theft? We Can Help You. Insiders pose the major threat to corporate assets. Private businesses, multinationals, and public corporations are under a constant danger of a compromise of their data security executed by an insider. Our state-of-the-art forensic laboratory, coupled with cyber forensic experts enables us to recover obliterated data from computers and a wide range of electronic storage devices like pen drives, hard disks, CD/DVD and the like.